Researchers in France have conducted a striking experiment in animals to measure the chronobiological effects of resveratrol (rez-vair-ah-trawl), known as an antioxidant derived from red wine. Male rodents were administered resveratrol at three different dosages, equivalent to 56 mg, 140 mg and 350 mg, during light (day) and dark (night) periods and measurements of oxidation (TBARS- thiobarbituric acid reactive species) were conducted in heart, liver and kidney tissues. The result of the tests in rodent heart tissues is provided in the chart below. Similar results were obtained in liver and kidney tissues. Control (control group) represents dark and light exposure without resveratrol. Vehicle represents the accompanying carrier used to administer resveratrol. The dark black horizontal bar at the top of the chart represents dark (daytime) hours and the white outlined bar represents light (day) hours. 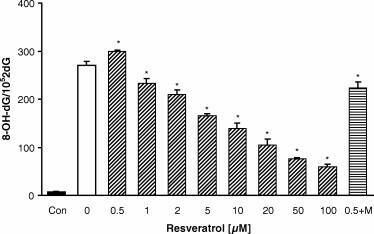 The experiment reveals resveratrol significant reduces a measure of oxidation during darkness and produces opposite effects during hours exposed to light. A prior study conducted by researchers in Spain examined the synergistic action of resveratrol and melatonin, a hormone produced by the pineal gland during sleeping hours. 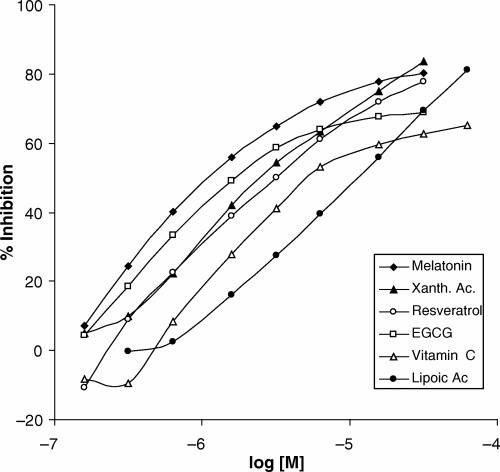 Here is a chart (above) from their study showing that melatonin and resveratrol, at different levels of concentration, when employed separately, exhibit similar antioxidant effect. 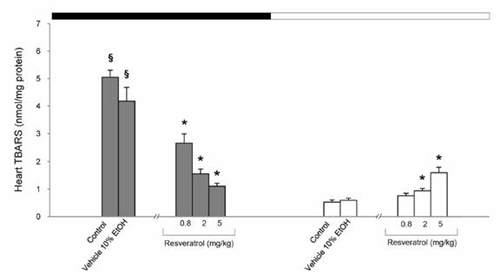 In this chart (above), resveratrol exerted stronger antioxidant effect as dosage increased, but this effect was reversed by melatonin. The researchers in Spain show that melatonin is effective at reversing the pro-oxidant DNA damage produced by low-dose resveratrol. Resveratrol in the presence of other antioxidants such as vitamin C and gluthatione, also loses its pro-oxidant effect and behaves like an antioxidant. The pro-oxidant effect of low-dose resveratrol probably emanates from its vulnerability to oxidize in the presence of heavy metals such as copper. At first glance, readers may presume a conflict between the findings of the researchers in France and Spain. Carefully consider the study conducted in Spain probably was conducted under lighted conditions when melatonin production from the pineal gland at the base of the brain is very low in mammals. So the experiment conducted in Spain represents totally artificial environment.